The throwdown began with the charter team bout which switched gears almost immediately. The first jam started with OHRD putting their best quad forward with The Smacktivist grabbing the lead jammer position right off the whistle and exploiting a 4-3 track advantage for four grand slams. Ann Arbor's Slamuel Jackson answered with 20 points of her own in the second jam leaving the score tied 20-20. Then the trench warfare began. Both teams showed their defensive prowess through the next jams. In the third jam The Smacktivist was held to only three points despite starting with a track advantage. Ann Arbor gained only two points over three jams and seven over four. The fourth jam saw Jesse “Ava Tarr” Fox neatly recycle Ann Arbor's jammer and the sixth saw Zee “Loraine Acid” Gulertekin follow suit and hold the opposing jammer to a single scoring lap despite having lead status. The seventh jam brought a thin pack through penalties and Ohio's Burnadeath regained the lead by a single point despite a power jam bringing the score to 27-26. In the next two jams both teams attempted star passes while not having lead resulting in call offs. Despite two spectacular offensive plays by The Smacktivist in the tenth and fifteenth jams and three more star passes between the two teams, the first period continued as a low scoring slugfest. Each team had a power jam with track advantage that was not fully capitalized on and both teams ended the period with double digit scores. Ohio had pulled slightly ahead 98-56 at the final whistle. A total of 47 penalties between the two teams underscored the physicality of the bout. The halftime locker room adjustments fine-tuned Ohio's defense further as the Brawlstars were held scoreless for the first four jams and to a mere ten points in the first eight as our hometown heroines clawed their way slowly up the scoreboard to 150-66. Then the gears shifted again. The ninth jam saw both teams power jam and Ann Arbor began the tenth with a power start that netted them only nine points. Their first of two star passes for the half in the eleventh gained them no points as Ohio slowly increased the offensive pressure. The dam gave way as Lora “Outa My” Wayman wore the star for four out of the final ten jams and muscled her way through for a total of 42 points. With the jam clock becoming the game clock and a power jam starting three seconds before, Wayman exploited a track advantage to cement the victory with 20 points at 244-139. 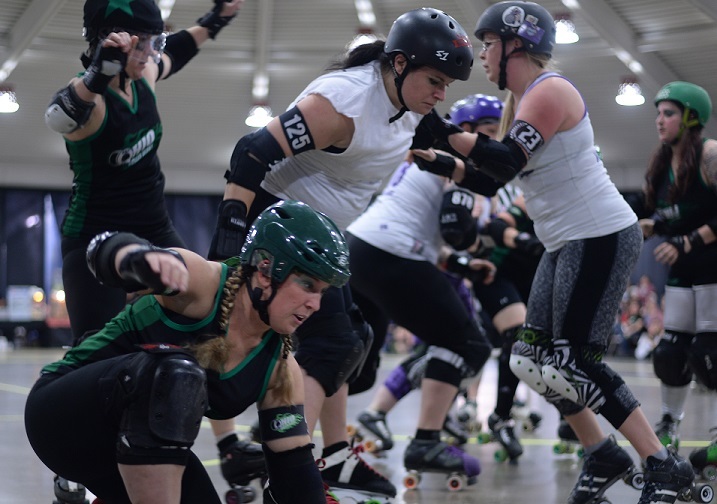 The bout was exceedingly physical from start to finish and set the stage for the B-team matchup between Gang Green and Ann Arbor Bruising Company. The second bout was even more physical, penalty laden and hard fought. Gang Green opened with a finesse play. In order to counter Ann Arbor's Sonnet Boom's acquisition of lead jammer status, TactiGal executed a star pass to Val Holla during a power jam. A waterfall of blockers didn't make the breakthrough to exploit advantage. Ann Arbor made their own star pass in the third but it netted them no score. In the fourth jam Val Holla was knocked out of bounds and tapped hips with her hips on the ground ending it 18-8. The Bruising Company took the lead in the fifth with a power jam and track advantage but after the sixth Gang Green held them scoreless at thirty points for five jams as they methodically regained the lead. Both teams switched to a more offensive orientation subsequently but penalties marred play. Gang Green's Val Holla managed to net herself three penalties in the twelfth and thirteenth despite a being lead jammer in both and power starting in the latter. In fourteenth jam, an egregious high block penalty caused the expulsion of Ann Arbor's Captain. Over the six final jams of the first period Gang Green extended their lead to 32 points closing the half at 117-85. The second half was an even more explosive affair. TactiGal picked up a quick three points for Gang Green in the first jam. Karmabal Lectur capitalized on a power kill and 4-3 track advantage for three grand slams before being power killed herself at the end of the jam leaving the third jam to start with both team's jammers on the pine. The Bruising Company slowly closed the gap and regained the lead during the next five jams during which time Gang Green's Last Call Ta'Killya had to be helped from the track by medical personnel. Scoring continued in small amounts on both sides as the lead changed hands three times between the eighth and sixteenth jams. In the seventeenth jam Gang Green established dominance with two power jams and five grand slams from Paige Bleed. In the eighteenth jam, Gang Green jammer Betty T. KayO fouled out. Ann Arbor's jammer, Yosemighty, then attempted to begin a final rally by bringing the score to 218-211 in the next jam. The final jam literally had the entire crowd on its feet screaming as it began with one minute twenty one seconds on the game clock and a full two minutes on the jam clock. Gang Green began with a 4-2 pack advantage which Val Holla neatly parleyed into lead jammer status and a power jam. This was quickly followed by a double power kill with fifty seconds remaining. Val Holla was the first off the line with thirty four seconds remain and she managed to break through and score the points needed to bring in victory with 226-225 photo finish. venue. If the season opener sets the tone for the season, fans can expect 2016 to be very physical and tactically innovative. They can be seen next at home rolling against the Ithaca League of Women Rollers from Ithaca, NY, on April 2nd at the Ohio Expo Center.